Jay Jay Revlon was born and raised in Peckham. At 25, Jay Jay is the youngest to feature in our Black Gay Slay series, he could also be the hardest working. He is an MC/Host, DJ, Voguer and Special Events Organiser of the Iconic Legendary International Undeniable Unforgettable House of Revlon. Along with fellow voguer, Sydney UltraOmni, Jay Jay set up English Breakfast a hub of the London ballroom scene. Jay Jay also has a regular night which is endorsed as of and for the vogue scene, by a London ballroom scene builder. He creates space for dance as part of the ballroom scene and makes time to DJ all over London. Jay Jay aims to spread the light and joy of vogue and the London ballroom scene through his work that, he proudly points out, focuses on moments created by people of colour in spaces inclusive of all but with queer people of colour at the heart. This June, Jay Jay contributed to Late at Tate Britain as part of a series of events inspired by the Queer British Art Exhibition at Tate Britain where he spoke about music and dance floors as sites of resistance. A month later, as part of Performance at Tate Britain, Jay Jay hosted a special dance party and vogue event. Revlon also presented The London Ball “All Things London” the Remix! Folks vogued and paid a royal tribute to the icons, legends and pioneers of London fashion, culture and decadence with a ball fit for a queen! While originating in the US, vogue has a long history in the UK. British dancers Les Child and Roy Brown immersed in the NYC scene founded the UK’s first vogue house, House of Child, in 1988. Soon after they brought voguing to London at fashion shows and parties. Jay Jay’s work seeks to build on this UK tradition of voguing and he is keen to run further and faster with it than anyone. Jay Jay has collaborated and performed with prominent ballroom figures from the US like MikeQ, Byrell The Great, Vjuan Allure and Twiggy Pucci Garcon. Dedicated to ballroom, its history and culture, Jay Jay gives workshops, takes part in ballroom discussions and interviews, and throws and curates vogue balls and related queer cultural events. Jay Jay’s advice for first-time voguers? Jay Jay hosts Lets Have a Kiki, a fun and successful club night in East London featuring house and vogue music. He’s unstoppable and personifies the words Fierce and Slay reflected in his work and reflected in much recognition including the Grand Prize Vogue Fem – The World Ball Stockholm, Sweden – March 2016. Jay Jay Revlon a Fierce talent, Giving Light to BlackOut and for that we are grateful! Jay Jay’s Top Tips . . . It helps you understand your body and muscular structure and gives you a different insight to your body. Film: Kiki – it’s a documentary that showcases the lives of ballroom people of colour, shows the importance of outreach and it educates you on why you should vote. Play: Bashment Granny – Keith ‘Shebada’ Ramsay a Jamaican actor and comedian and someone who probably had a hard time in Jamaica. But seeing those plays – on DVD cause I’ve never seen one live – I got the sense that he got me. 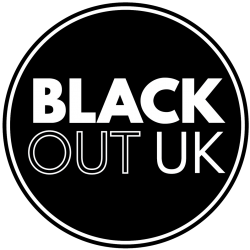 Website: I don’t think there are any Black gay websites in term of how people would use one as Black Queers and particularly as far as history. For me to look at a website – if it isn’t about buying clothes! – it’s for history and there isn’t any other than BlackOut. What makes you happy? Dance, and seeing other people dancing and having fun at my events. It makes me happy to see others enjoy what I’m giving and what I’m creating. What I give is joy and when I teach it’s from a joyful place. Even when I’m strict on the students its because I’m wanting you to have fun and be joyful. What makes you cry? Nothing lately to be honest. It’s been a long time. At funerals. . . it has to be at that level. Although I remember watching Moonlight and I was like OMG but I didn’t actually cry. It was beautiful but I needed to see more of the story with his mum. For me that was the bit that made me potentially tearful. I grew up with a single mum and it was sad how he couldn’t do anything but try to help her. What makes you angry? When people give light to negative things. For instance there’s this DJ deadmau5 who tweeted that Ballroom culture is not inclusive and racist, mainly in the US because he hasn’t spoken to me. The reason he was saying this is because he can’t get a foot in. He’s a massive rich DJ who wants to learn the beats so that he can stay current. People give him light and then others come to his work through that negative light he’s put out and think, oh I really like his music. Now that makes me angry. Why are you giving this light! It’s not about being aware. Just ignore it. The post that is genuine to me is the post I’m gonna share. I only share positive things. Things I find questionable and even when post are describing/saying gay people are this or that, I just don’t care and would not pass that negative light on to others. Most news articles focus on stuff like that, sensationalising stuff so that it gets shared. That gets me angry because there is so much more going on and so much more positive than negative stuff going on. Someone will post something like ‘I just got my degree’ or something positive and then people are like ‘why you are bragging’ and that post gets 10 likes. What makes you laugh out loud? I like shade! When someone reads and then the person has a counter and the counter is so much better that you can’t actually speak after hearing it. In the balls when people walk the categories and the theatrics of it all .. it makes me laugh out loud .. it gets me every time! This year I hope …. That the London ballroom scene gets bigger and more people become aware of the scene, and particularly more people of colour actually get involved in the scene. I want to bring in people I see and get them to come to Balls so they know there is a scene for them. Ballroom is a place of love and I want more people of colour to come out and support this scene – it started with us and it should be powered by us. Oh! and I want to own a venue! An open space for everyone – a multipurpose space that is gay and light! When I teach, the people who are there and who are really trying and learning; this makes me try harder and teach better. That reciprocation!